Discreet, simple, and elegant—but Flowerpot to the very core. 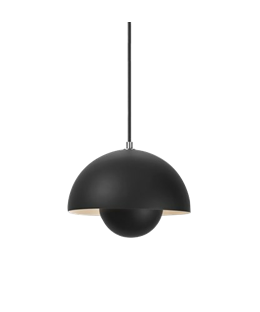 Flowerpot VP1 Pendant in Matte Black was inspired by the Flower Power revolution of the 60s and 70s. Flowerpot is a gorgeous lamp collection available in a range of colours to help you make the lighting in your home a little more stylish. With its two hemispheres hovering one above the other, the Flowerpot collection has long since proven that its design qualities are timeless. The lamps are a beautiful and classic example of design that is just as well-suited for our times as it was for the happy 60s - in fact, they are almost more popular today than they were back then. The continuous addition of more colours to the collection means that there will always be a lamp to suit your home. The diameter of the sphere on top is exactly double of the one on the bottom, which ensures perfect balance. The Flowerpot collection consists of pendants and table lamps, both available here at Lampemesteren.